One of the most common questions I'm asked about lifting is "How much weight should I lift?". I remember the first time I stepped foot in the gym and had no idea where to start! 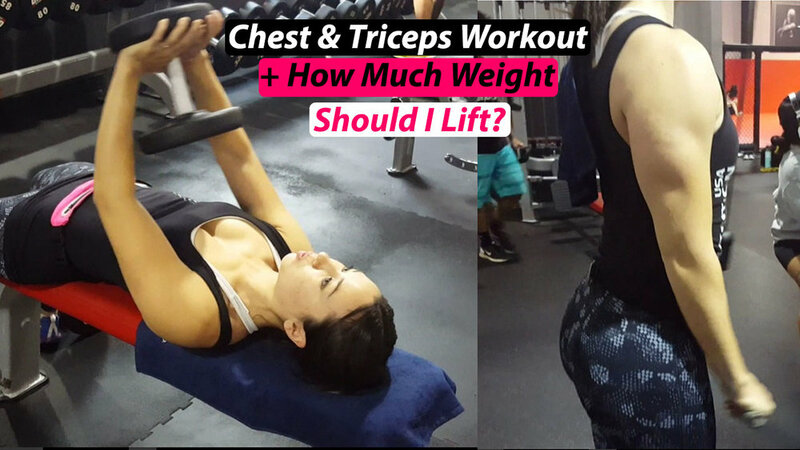 There is such a wide range of weights available in the gym, so if I've never lifted, it's nearly impossible to determine how much weight I should be lifting! Starting a new gym routine is intimidating as it is. My first time in the gym I was worried about how to perform all of the exercises, how to use the machines, and how much of an idiot I looked like to everyone around me. Having to worry about how much weight I should be lifting, on top of all of this, was such a nightmare. For the longest, I underestimated how much I could lift, and picked up weights that were way lighter than I should have been lifting. Had I known what I know now, I would have seen results so much faster! Unfortunately, I see this same mistake being made by so many women I see in the gym. It's a shame because if you're not lifting to your full capacity, it will be really difficult to see results. You will find yourself hitting a plateau pretty quickly. How much weight I should lift will depend largely on what rep range I am trying to hit. Some of the most common rep ranges are 6-8, 8-10, or 12-15 reps (although there are many other ranges you can you). So, if I do a bicep curl with a 15 pound dumbbell and perform 6-8 reps vs. performing 8-10 reps, which is the better rep range? Assuming my form and execution for each rep are the same, the 8-10 rep range is clearly better. So does this mean I should always perform higher reps? Of course not! When performing an exercise, the difference is not in the rep range itself, but in how much weight I'm pushing for that rep range. So, when I ask myself, "how much weight should I lift?" the rep range is the first thing I'll take into consideration. When I'm told to hit an 8-10 rep range, what this REALLY means is that I should be failing around the 8-10th rep. Same thing with the 6-8 rep range. So, if I can perform 10 bicep curls with 15 pounds before failing, I should NOT be using 15 pounds when I'm trying to hit a 6-8 rep range. I should be going much heavier, maybe a 20, or 25 pound dumbbell, and failing between 6-8 reps! What does it mean to lift to failure? Failure means I cannot perform another rep without compromising my form. So, if I'm working in an 8-10 rep range, but get to the 10th rep and am able to perform 11 reps, I went too light and should have chosen a heavier weight. If I'm working in this same rep range but don't even make it to 8 reps before failing, I went too heavy and need to choose a lighter weight. So next time you ask "How much weight should I lift? ", pick up the weight you think you'll need a do a set. If you are failing at your rep range you are good to go, if not adjust on the next set. It's really that simple!